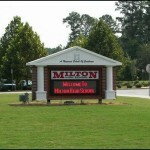 The new Milton High School, completed in 2005, is the replacement for the historic Milton High School. Breedlove Land Planning provided the site design services for this state-of-art Fulton County facility. The beautiful campus is one of the nicest in the state. The football stadium was one of the first in the meto-Atlanta area to have an artificial turf playing surface. All of the athletic facilities are unparalleled, which is appropriate for teams that compete for state championships in virtually every sport. Just as Milton High School excels in both academics and athletics, the campus also appropriately is one of the most progressive and sustainable in the state. The campus features a wet pond that stores harvested rainwater for irrigating the sports fields. Additionally, the stormwater from all impervious surfaces are treated through a system of thirty-six bio-retention cells, three sand filters, and a stormwater wet pond. LAST UPDATED MAY 2010 ©2010 BREEDLOVE LAND PLANNING, INC.